In small bowl, combine 1/2 cup of the chopped pepper, corn, green chiles, pepper Jack cheese, cream cheese, onions, lime juice, salt, dried basil and pepper; mix well. Heat oven to 375°F. 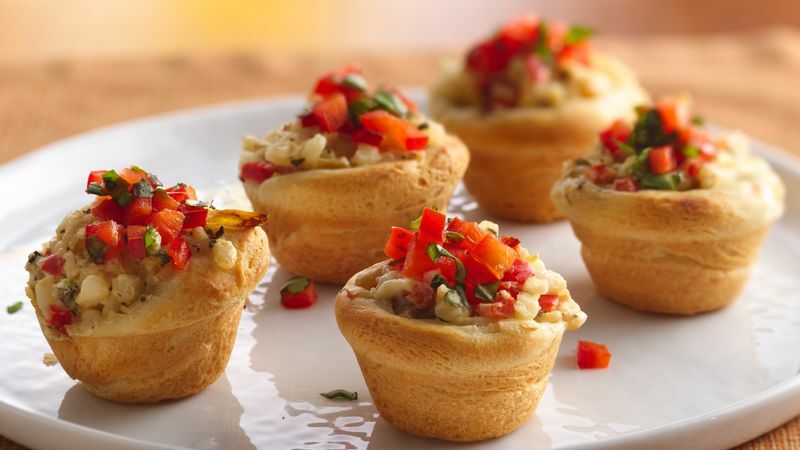 Spray 16 mini muffin cups with Crisco® Original No-Stick Cooking Spray. Remove crescent rounds from can; do not unroll. Using serrated knife, cut roll evenly into 16 rounds; carefully separate rounds. Press each round in bottom and up side of cup. Spoon 2 tablespoons of the corn mixture into each cup (cups will be very full). Bake 17 to 22 minutes or until edges are golden brown. Cool in pans 10 minutes. Transfer from pans to serving platter. In small bowl, mix remaining 1/4 cup bell pepper and fresh basil. Top each popper with about 1/2 teaspoon pepper mixture.